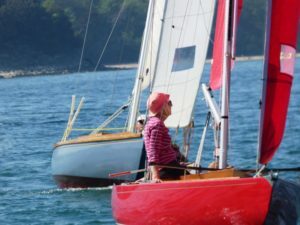 Sunshine, reasonable tides and light airs bode well for the early May Bank Holiday weekend keelboat racing; for the Redwings it was the first races of their season and the Quail Trophy, and the One-Designs, who are a month into their season, it was for the Woodroffe Bowl. Saturday was programmed for two races for both fleets; starting from Janson, the eight Redwings made steady progress to Tara with Colin Samuelson in No 11 Toucan leading the way by remaining offshore. 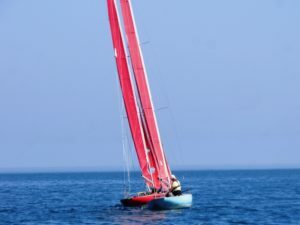 Nick Wakefield in No 35 Bizarre was second and Joe Robertson in No 24 Red Gauntlet II was third as they headed down wind to Derrick however with the breeze dying and the tide taking them to Ryde, it was a bit of a lottery particularly as they reached the leeward mark. On the beat back to Janson positions consolidated with Toucan finishing over two and half minutes ahead of Red Gauntlet II with Jonathan Nainby-Luxmoore in No 5 Snowgoose third. The nine One-Designs also had Tara as their windward mark but did not have to go as far as Derrick as a leeward inflatable had been laid prior to the line being set. Robin Joy sailing single handed in No 10 was shut out at the start and although it looked at one stage on the slow run to the inflatable that he might catch up, it was not to be. In the meantime, Mark Grzegorczyk in No 9 was first to round the windward mark, with James Palmer in No 3 and Rob Mathieson in No 1; however by the time they reached the leeward mark, No 1 had taken the lead and finished just over 30 seconds ahead of No 9. D Orange in No 12 was third. Having finished ahead of the back end of the Redwing fleet, the One-Designs were first off for the second race. With the F2 breeze veering to the SSE, the windward mark was Under Tyne, the leeward mark was Janson with the finish at Under Tyne. Mark Grz again probably had the best start and this time hung onto the lead throughout. Alexander Ross sailing single handed in No 11 was second and Hugh Doherty, also single handed after his crew had jumped ship between races – something about having to cook supper!) was third in No 4 despite having to re-cross the line at the start when his attempted approach from the on course side failed. The start of the second Redwing race was certainly interesting with Mike Toogood, the new owner of No 20 Tara, Joe Robertson in No 24, Red Gauntlet II and Jonathan N-Luxmoore in No 5 Snowgoose having a difference of opinion at the start! Colin Samuelson in Toucan again lead the way from the start and finished just over a minute ahead of Red Gauntlet II with Snowgoose third about twenty seconds later. 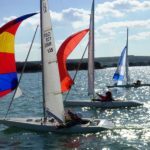 More glorious sailing on Sunday afternoon with the SE F2 breeze holding offshore. The Redwings were only scheduled for one race; the One-Designs for two so a fair bit of thought had to be given to the courses. After a good start for most, the first beat for the eight Redwings (Toucan was not racing) was to Cochrane; the fleet split with half going inshore and the others staying offshore where there was more tide but a steadier breeze. 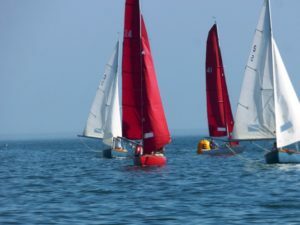 In the event, although those who stayed out were the first to round the windward mark, there was actually little in it. Nick Wakefield in Bizarre lead the way to Fitzwilliam and then to Drum but there was not a lot separating them as they weaved their way trying to remember where Drum was! As they came back up through the line, Joe Robertson in Red Gauntlet II had moved up into second place ahead of Philip Bown in Redwing. A course change to put them on the same course as the One-Designs who had just started their second race worked well and added to the excitement. With Under Tyne as the windward mark and the finish and Britten as the leeward mark, it looked as if Bizarre had done enough to take first place, however Red Gauntlet II had better boat speed on the final tack to the line and crossed a second ahead – exciting stuff after just over an hour an three quarters racing. Robin Ebsworth in No 41 Quintessence had an excellent second round and was 3rd. 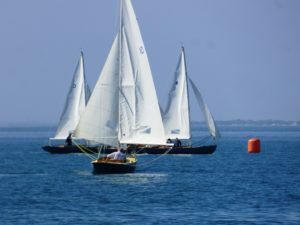 The first of the One-Design races had Tara as the windward mark, Fitzwilliam as a wing and Britten as the leeward mark. Like the Redwings, the seven boats (the Beart’s were not racing) split tacks with those staying offshore just coming out ahead. Although not much in it, Andrew Palmer in No 3 was first to round Fitz closely pursued by Alexander Ross in No 11 and Hugh Doherty in No 5. On the way to the finish via Britten Mark Grzegorczyk in No 9 made up a number of places and ended up with another first after Hugh had had to take a penalty. Andrew was third. It was a close run thing whether the second race could be got off before the Redwings came back through the line, however in the event it worked perfectly. The majority initially stayed offshore as they beat to Under Tyne; Sarah Marshall in No 7 was first to round with Alexander in No 11 and Robin Joy in No 10 hot on her heels. Although by no means a procession to Britten and back to Under Tyne, this just remained the finishing order with Alexander crossing the line in second a second ahead of Robin. 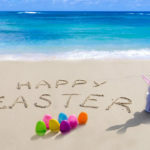 Apparently it was the hottest ever early May Bank Holiday Monday on record – it certainly was almost champagne sailing although a few more knots of breeze at times would have been even better. 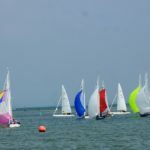 With only one race scheduled for both fleets, and needing enough water to get back to the harbour moorings, the courses were planned for just over an hour and a half. In the event, the wind died a bit on the penultimate leg so everyone was out there for a bit longer, but no one seemed to mind too much. 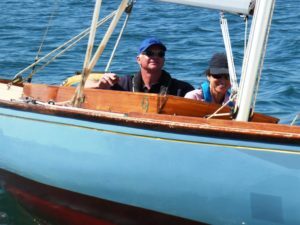 At the front of the Redwing race it was nip and tuck the whole way round between Becky Samuelson helming Toucan and Joe Robertson in Red Gauntlet II. Joe was initially ahead but Becky managed to get Toucan pointing slightly better and finished a minute ahead. Jonathan Nainby-Luxmoore in Snowgoose was always in third albeit some way behind. Mid-fleet was not easy either with places changing on each leg and with the final beat a real challenge. 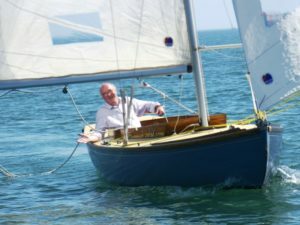 Having been well back on the first round, Richard Jessel in Blue Jay II made a massive gain on the final beat and came in fifth. In the One-Designs, Mark Grzegorczyk in No 9 looked set for another win, however after leading for the majority of the race, he was overtaken by Suzie Beart in No 5 on the final beat back from Drum to the finish at Garland who went almost into Priory Bay before tacking for the line after spotting the better breeze coming out of the harbour. Although always in with a chance, Rob Mathieson sailing single handed in No 1 was third ahead of Hugh Doherty also sailing single handed in No 10. Congratulations to Joe Robinson in Red Gauntlet II who won the Quail Trophy and to Mark Grzegorczyk in No 9 One-Design who won the Woodroffe Bowl.